Remember the iconic movie Terminator? I was fascinated by a particular scene wherein Arnold would put on a pair of super stylish dark goggles and at the very same instant; he would be able to see all the information on how to fight with his archrival Skynet’s minions? Or the time when Robert Downey Jr. Would toggle a switch in his flight suit to see the strengths, vulnerabilities and weapons available on Obadiah Stane? Pretty cool, right? How would you feel if you knew that this was not some random imagination but if you had an archenemy and he wanted to destroy you, all he’d have to do would be take a look at your web surfing history. Don’t get me wrong. It’s alright that you use incognito for certain chores you do online. However, Google’s super smart algorithms work their way around and aim at giving you a better personalized web surfing experience. For instance, you may have noticed that you get shopping ads on sites that you visit for the first time. How? If you like to shop online, Google collects that information about you and shows you personalized ads. Most browsers today offer the option to log in and work your way around. You use services like Drive, Gmail, YouTube, Picasa, Translation, Nest, Waze and Maps – all the brilliant services by Google and that too for free. However, you agree to share information about yourself with the tech giant who then exchanges the same with advertisers to sell targeted ads. Some of this info you share right away such as your name, mobile phone number, location and in other cases, your preferred method of payment, preferred shopping sites and so on. It is not surprising that Google holds more data about us than maybe our own family. Depending on what tools you use, one can paint a pretty comprehensive portrait of you simply by using Google’s data and recreate an individual who thinks like you, has similar desires, political, and spiritual beliefs, listens to the same music as you do and reads the same books as you. Ever wonder, why you get suggestions of the same restaurants you highly rated the last time? 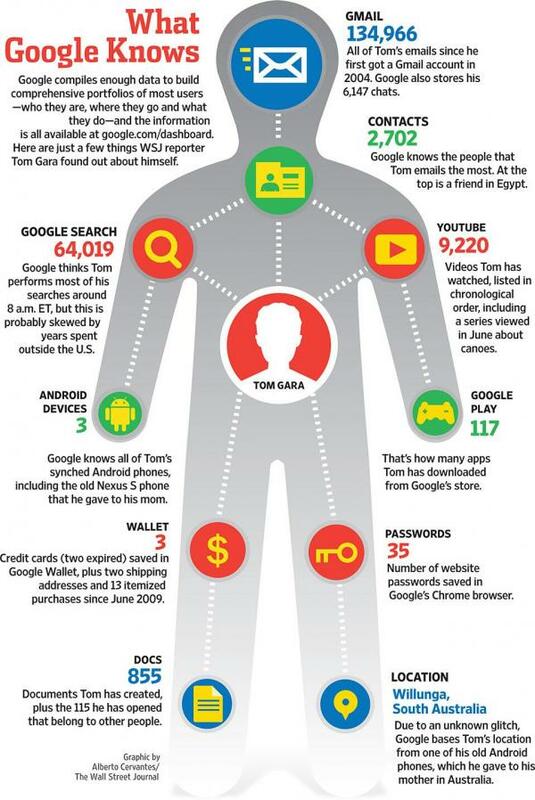 In a nutshell, Google has your digital life in its hands. You can take a look at what data Google holds on you by logging into My Google Account. Go to ‘Personal Info & Privacy’, scroll to ‘Activity Controls’ and click on ‘Manage Activity’ under ‘Your Searches & Browsing Activity’. Click on ‘Insights’ and you can track all of your web surfing history from time to time. I guess, what goes once on the World Wide Web, stays on the web forever!